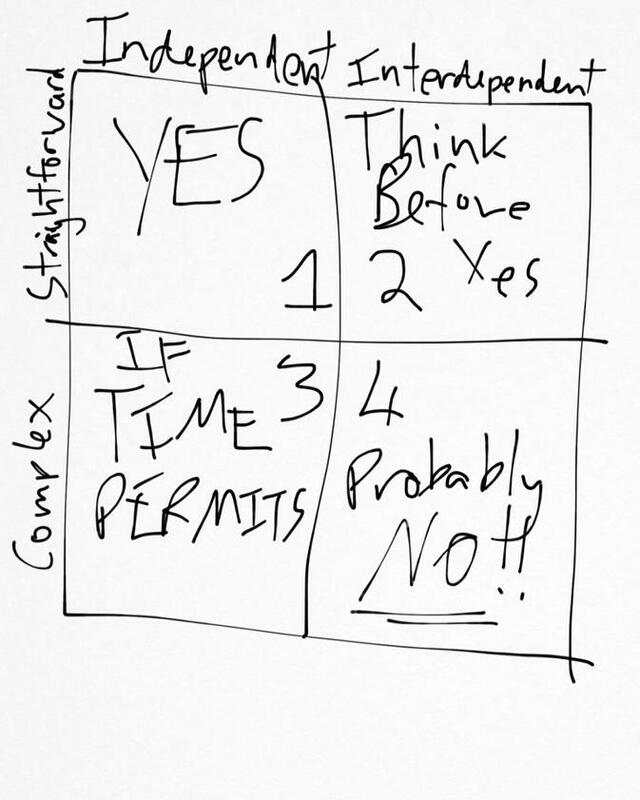 This is where we the developer/design want to be: The “Yes” Quadrant. It won’t take long to implement it and it won’t really affect anything else we’re trying to achieve on the project. It’s great these features are straight-forward to implement however we need to be mindful of the interactions with other system components before we jump in and start implementing otherwise the implementation could cause a ripple effect of additional retesting and modifications to other design aspects. In this Quadrant it comes back to schedule, cost and prioritization issues. Ultimately if there’s enough time and money to implement these sorts of features at least they’re independent enough to not affect other aspects of the product. No matter how you slice it, the answer to these should be either A) we need more time and money to implement this or B) No. No - no - NO! I also talk about this on Episode 45 of Pragmatic.